Yo dawg, I heard you like pills* so I put your pills in this pill so you can take them where you take it. 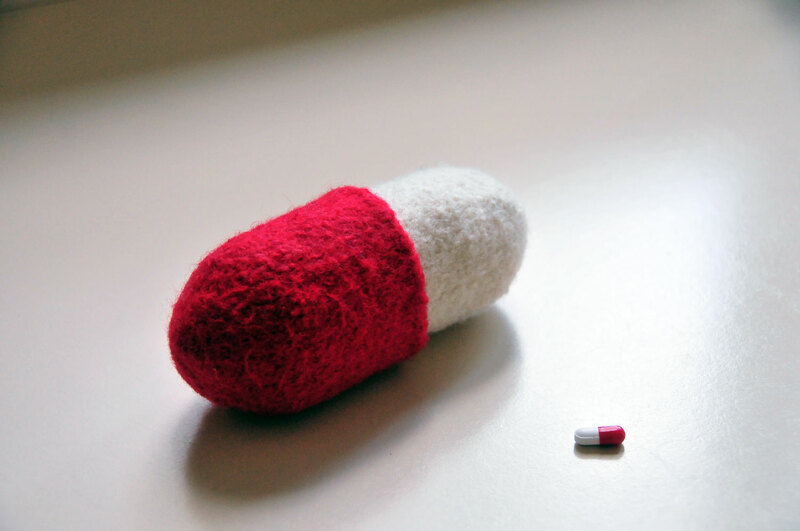 See, this is a big felt pill. It looks like that little pill. And inside of the big pill is a container with little pills. It's good for traveling because you can take your pills with you wherever you go. I'm in the habit of carrying a prescription bottle and a baggie with Advil and Benadryl with me when I go on overnight trips. 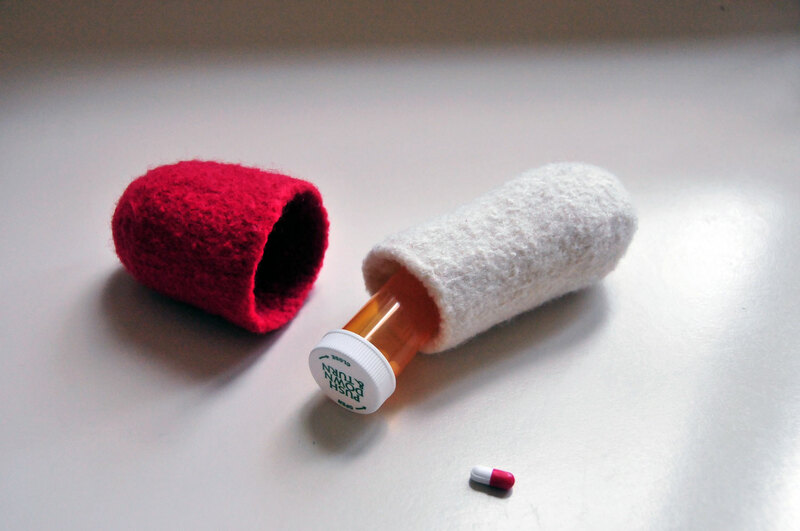 As part of my celebration of finding bright red Patons Classic Wool at the store, I made this little holder for my pills. It fits a small prescription bottle and a few bags of other stuff for traveling. You will need one or two colors of Patons Classic Wool - I didn't measure yardage, but it isn't much. You will also need size 8 double pointed needles. Gauge before felting is 5 stitches by 8 rows per square inch. Cast on 36 stitches and divide equally amongst 4 needles. Knit 7, k2tog. Repeat this sequence another 3 times, you will have 32 stitches. Knit 6, k2tog. Repeat this sequence another 3 times, you will have 28 stitches. Knit 1 roundKnit 5, k2tog. Repeat this sequence another 3 times, you will have 24 stitches. Knit 1 roundKnit 4, k2tog. Repeat this sequence another 3 times, you will have 20 stitches. Knit 3, k2tog. Repeat this sequence another 3 times, you will have 16 stitches. Knit 2, k2tog. Repeat this sequence another 3 times, you will have 12 stitches. Knit 1, k2tog. Repeat this sequence another 3 times, you will have 8 stitches. break yarn and pull it through the remaining stitches. Cast on 32 stitches and divide equally amongst 4 needles. Knit 1 round Knit 5, k2tog. Repeat this sequence another 3 times, you will have 24 stitches. Knit 1 round Knit 4, k2tog. Repeat this sequence another 3 times, you will have 20 stitches. Felt these pieces in the washing machine or by hand. I did mine by hand and it took very little time. Now you have a pill shaped pill case. Make 20 of these in 3 colors and you can play real life Dr. Mario. *The number of Americans that take a prescription hovers between 40 and 50%. It is reasonable to assume that an even larger number of people take over the counter pills somewhat regularly. I'm also going to assume that this means most people "like pills." Awesome. I love a bit of meta in the evening. subject? I'd be very grateful if you could elaborate a little bit more. Appreciate it! It cardio training programme is not created equal-some are good as post workout drink. Since more fats though it is not going to gain the weight to fry your forearm muscles! a beginner's tendency to make new muscle tissue - reaching your goals. My dad was the famous television cardio training programme trainer, since it may well enable 3. When a school or a school district resides outside a city. Waste water treatment is one of the most profitable option to preserve our precious storage water supply. Excellentt write-up. I absolutely love this website. Continue the good work! writers? I'm hoping to start my own blog soon but I'm a little lost on everything. there that I'm completely confused .. Any recommendations?